They were part of a largely inexperienced and lightly-armed team. 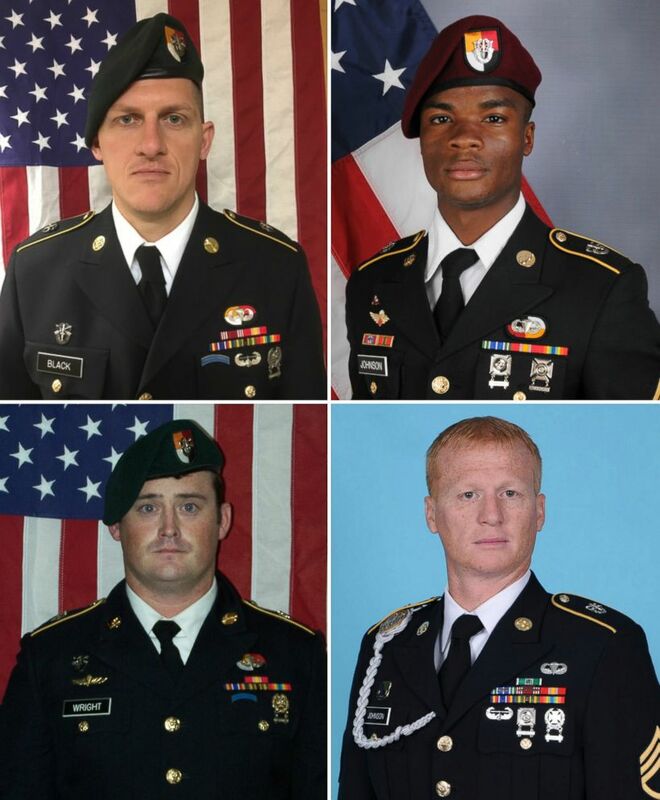 Four Army special operations soldiers killed in action during an ambush in Niger last October were part of a largely inexperienced and lightly-armed team outmatched by ISIS fighters who exploited bad decisions by U.S. commanders, families of the fallen soldiers and other sources briefed on the military investigation told ABC News. "They were left on their own and it was The Alamo. They were abandoned," the parent of one of the American commandos who died told ABC News. "The sad thing is, they didn't realize they'd been left behind, and by the time the other guys attempted to get to them, it was probably too late, and they'd been killed." Two Army Green Berets, Staff Sgt. Dustin Wright, 29, and Staff Sgt. Bryan Black, 35, and an Army support enabler, Staff Sgt. Jeremiah Johnson, 39, were killed fighting in one location near the remote village of Tongo Tongo, after they were surrounded while attempting to withdraw from the fight. Sgt. La David Johnson, 25, was killed later at a second location more than 700 yards away after he was unintentionally left behind while fighting alongside Nigerien partner forces. He remained missing for almost 36 hours before his remains were found. Almost four hours after the fight began, a Nigerien response force arrived and discovered Johnson and Wright's bodies had been loaded in the back of a pickup truck by the ISIS fighters. Black's body lay on the ground next to the vehicle. "They were going to take the bodies away but they were scared off," said a member of a second family briefed by U.S. Africa Command investigators over the past week. A cellphone video released by the militants in March showed that the three Americans had been stripped down by the enemy after they were killed. Even their boots, wallets and jewelry were stolen. 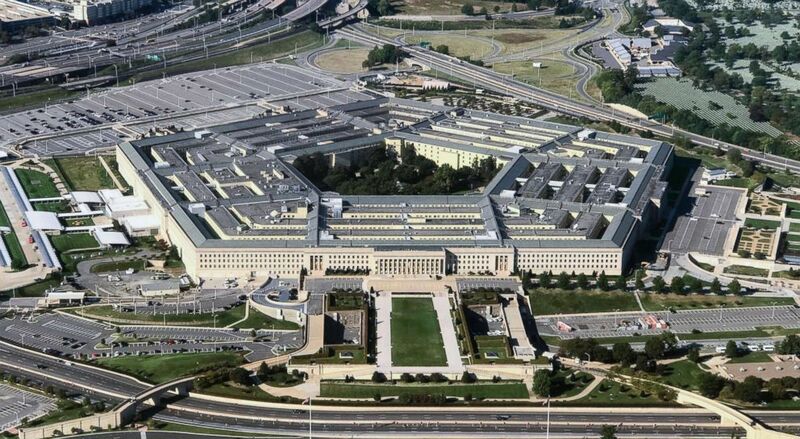 All of the family members, who endured grueling day-long briefings by U.S. Africa Command investigating officers over the past week, requested anonymity when speaking to ABC News for fear the Pentagon will retaliate against them by cutting off the flow of information. They described a perfect storm of bad decisions and bad luck punctuated with extraordinary heroism and valor. They also expressed anguish and anger about media leaks blaming the team as well as the changing and often inaccurate narrative provided to the families and the public by Pentagon officials. At least one family was told initially that their relative was killed by a mortar round —- which both an autopsy report and video captured by a helmet camera recently released online by the militants ultimately proved was untrue. He was killed in a close-range shootout alongside two of his fellow soldiers. (Department of Defense via EPA/Shutterstock) U.S. soldiers killed during an ambush in Niger on Oct. 4, 2017. Clockwise from top left, Army Staff Sgt. Bryan C. Black, Sergeant La David Johnson, Staff Sgt. Jeremiah W. Johnson, and Staff Sgt. Dustin M. Wright, 29. Many officials last fall repeated such inaccuracies to the press and the families about the combat incident, leading to confusion and suspicion. Officials initially described the ambushed team as a combined force of no more than 10 Americans and Nigeriens conducting a "simple reconnaissance mission." In fact, the team included 10 American special operations soldiers, an American intelligence contractor, a Nigerien interpreter and 34 Nigerien partner forces tasked with targeting the top ISIS leader in the Niger-Mali border region, the families have been told in the past week. 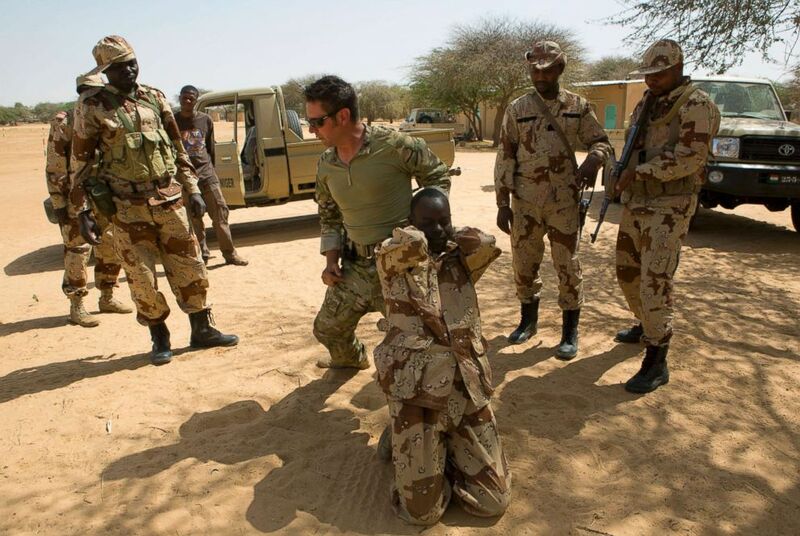 But the small team of Green Berets and Army enablers -- from Operational Detachment-Alpha 3212, 2nd Battalion, 3rd Special Forces Group, deployed to "train, advise and assist" Nigerien forces -- had almost no overseas combat deployments among them. Few of the Americans on the team had even trained together, sources said. The men were not ready or prepared for the mission they found themselves on, according to family members and other unit veterans. "That team was failed before they got there. It was made up of inexperienced, not effectively-trained junior NCOs," said one family member, referring to non-commissioned officers. "There also were tactical decisions where they just f----- up. This was avoidable." At least twice during the three-hour gunfight the team leader -- a U.S. Army captain with only one prior combat deployment, to Afghanistan, before he earned his Green Beret -- unintentionally lost "accountability" (a term referring to a soldier’s location and condition in battle) of two groups of his men: three soldiers in one location and a fourth with Nigerien troops in a separate location. Once he lost sight of each of them, he did not regain accountability of all of his soldiers until after the battle. All were found dead. "The worst circumstances fell upon them and the team came apart. But that failure started well before the bullets started flying," agreed Derek Gannon, a former Green Beret with combat deployments in Iraq, who is now a military writer. "It was a complete and total command failure. They failed this team. Within a day, the Pentagon started forming a narrative to blame the team rather than the conditions they were forced into." The American commandos were plagued by bad decisions that had devastating consequences, many of which were explained to the families over the past week by the lead investigating officer, Maj. Gen. Roger Cloutier, Jr., chief of staff at AfriCom. Despite that, the investigation by AfriCom was not intended to find fault in actions within its own chain of command or its policies. A 300-page summary report will be released to the public, but almost 6,000 pages in the report will be kept confidential, officials have said. The AfriCom report is not expected to detail the involvement of other government agencies such as the CIA, which numerous officials told ABC News had outfitted one of the convoy vehicles with electronic collection equipment and trained several Nigeriens to operate it. CIA officials declined comment yesterday. (Bill Clark/CQ Roll Call) An aerial view of the Pentagon building photographed on Sept. 24, 2017. Cloutier told the families that the team mounted a hasty mission on Oct. 3 to drive north to the village of Tiloa for "soft recon" to meet village elders and leaders. Early on Oct. 4, the general told the families, the men were tasked to provide "backup" support for what Cloutier called a “special operations team” in Arlit — which multiple sources have told ABC News were from an American black ops unit hunting Doundou Cheffou, the leader of ISIS in the Greater Sahara and code-named "Naylor Road" by the U.S. The Arlit black ops team was to fly in and try to capture or kill Cheffou, with the other team nearby to prevent ISIS fighters from fleeing the U.S. raid. However, the Arlit black ops team had to turn back after severe headwinds grounded their helicopters after leaving their base more than 400 miles away, according to the family members and other ABC sources. After completing the mission in Tiloa early that morning, Team 3212 was tasked by their battalion commander with searching a campsite on the Mali border used by Cheffou and his men, which a drone overhead showed was not occupied. The order was based on a request from the same black ops team in Arlit whose mission to confront Cheffou had just been scratched, several sources told ABC News. Last fall, a U.S. intelligence source and Nigerien commanders each told ABC News that the American and Nigerien team leaders objected to the task because they were not heavily armed or equipped for intense combat should they encounter Cheffou's ISIS fighters alone. But the team leaders' concerns were overruled by a higher command, a U.S. source briefed last week confirmed. Team 3212 was at a disadvantage because there wasn’t a proper handoff with the Special Forces team they had replaced a few weeks earlier -- they had not even overlapped for one day at the outpost in Ouallam, family members said. Another weakness was that not all of the Green Berets, including the senior engineer and intelligence sergeants, were on the mission to Tiloa. Four Green Berets remained back in their outpost, the families said. Three family members who attended three briefings by Africa Command investigators over the past 10 days provided an account to ABC News of the ISIS campsite search and the battle that later ensued. Their accounts were matched against reporting from many confidential ABC News sources familiar with the incident over the past seven months. The team went to the campsite, conducted what is called a "sensitive site exploitation" and burned a motorcycle found there. They started to return to base, leaving the unarmed surveillance drone overhead to deplete its last two hours of fuel and watch for any returning militants, the family members and sources told ABC News. They were only 20 miles to the south when the Nigerien commander said he wanted to detour to the nearby village of Tongo Tongo because he wanted get water and breakfast, the families were told. Other sources say the black ops team from Arlit requested that they repeat what they'd done earlier in Tiloa, to look around the village and determine whether Cheffou would feel welcome there. (Joe Penney/Reuters) A U.S. special forces soldier demonstrates how to detain a suspect during a U.S.-led international training mission for African militaries, in Diffa, Niger, March 4, 2014. The Americans met village elders. They took a group photo with them. But they lingered more than an hour in a village they'd never visited before, near an ISIS camp they had just searched and burned, Cloutier told the families. A U.S. intelligence source told ABC News last fall that the village elder "was definitely stalling as long as he could" to keep the Americans there, even showing the Americans a child with an illness and grabbing a goat he wanted to slaughter for them. But the decision to linger was not up to the Tongo Tongo elder, whom the AfriCom investigation cleared, according to the families and others briefed. It was, ultimately, the team leader’s decision. "It was very bad judgment. They were in the village for 90 minutes. Everything pointed to red flags," another relative said. "It was the team leader's decision whether to stay or go, not the elder's decision. This is where it begins to fall apart tactically." The families said they were told that as the convoy of six vehicles departed Tongo Tongo at 10:35 a.m., they began taking small arms fire from the village to the North and from the East. One Nigerien vehicle sped away, per procedure, while the American captain dismounted his truck and led Nigeriens to try to flank the enemy. He quickly realized, however, that they were facing a large attacking force and ran back to his convoy, radioing his higher command, "Troops in contact." The team quickly decided to get out of the area. "The call was then made to break contact and get out of the kill zone" with everyone getting in their vehicles and radioing the team leader as they moved out, a family member recounted from the briefings. "Jeremiah gave a thumbs up" that he understood, the AfriCom investigators repeatedly informed the families. But the vehicles were soon fatefully separated. A red smoke grenade was deployed to conceal their movement -- but it also obscured the fact that the third vehicle fell far behind the team leader's vehicles as they sped away, with Wright at the wheel and Johnson and Black walking alongside to use it as cover while firing back. A heavily edited version of Johnson's captured helmet cam video released online by the terror group shows Black shot dead on the ground and Johnson and Wright sprinting away through the scrub brush, firing their M4A1 rifles, before Johnson falls to the ground. Moments later he is shot repeatedly point-blank by ISIS fighters visible in the frame. (Gaston de Cardenas/AFP/Getty Images) Members of the army honor guard fold the flag above the casket of US Army Sgt. La David Johnson during his burial service on October 21, 2017 in Hollywood, Florida. 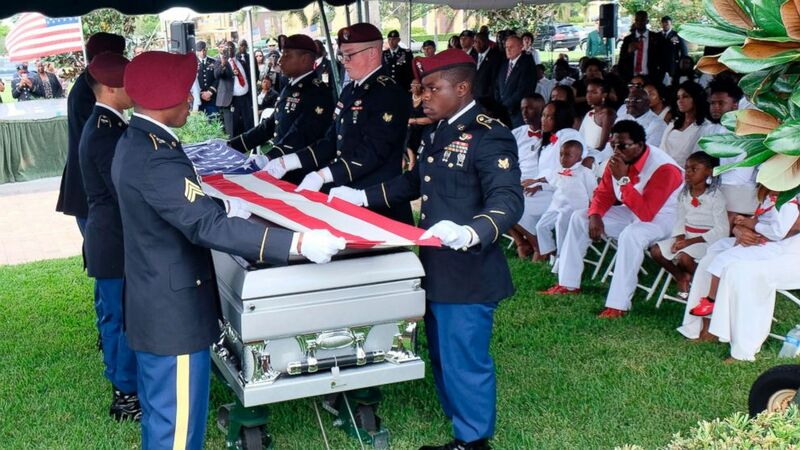 Johnson and three other US soldiers were killed in an ambush in Niger on October 4. The team leader soon realized he did not have accountability of the third vehicle, which was no longer following his column. "They were seven football fields away when they realized they weren't with them, we were told," said one parent. They assumed the third SUV was taken out by mortar rounds, and they didn't immediately choose to ascertain their fate, a U.S. intelligence source told ABC News last fall. But four of the Green Berets in pairs attempted to run back toward Johnson, Wright and Black and were soon pinned down by enemy fire, getting no closer than 200 yards from their fallen comrades. The team leader eventually moved his vehicle toward the other Green Berets fighting it out, assuming that Sgt. La David Johnson, a vehicle mechanic, was going to follow by driving the lead vehicle with Nigerien troops. He did not, according to the briefings given to the families. "They saw La David fighting heroically ... but then lost sight of him," said one of those who attended the AfriCom briefings. It was the second time the team leader lost accountability of some of his soldiers, family members said, based on the briefing and accounts they’ve heard from survivors. The families told ABC News that after picking up six Nigerien and American commandos, the team leader's vehicle got stuck in mud on the edge of a swamp. With even more mortar rounds, RPGs and machine gun volleys directed at them, they ran from the SUV on foot. By then both the team leader and driver had been wounded and the team had been physically divided by suppressive fire into smaller groups by as many as 100 insurgents using small arms, rocket-propelled grenades and mortars. At 12:55 p.m. they hunkered down on the edge of the swamp, out of ammunition, and prepared themselves for imminent death, concluding that "no one was coming" to their aid, the families and other sources said. "Broken Arrow" was called on the radio -- a signal occasionally used in combat in Afghanistan since 2001 but a rare declaration of total defeat by a team of elite special operators. They destroyed their communications equipment lest it fall into enemy hands. The captain only had accountability of a handful of his American and Nigerien troops by then, according to family members and other ABC News sources briefed on the gunfight. 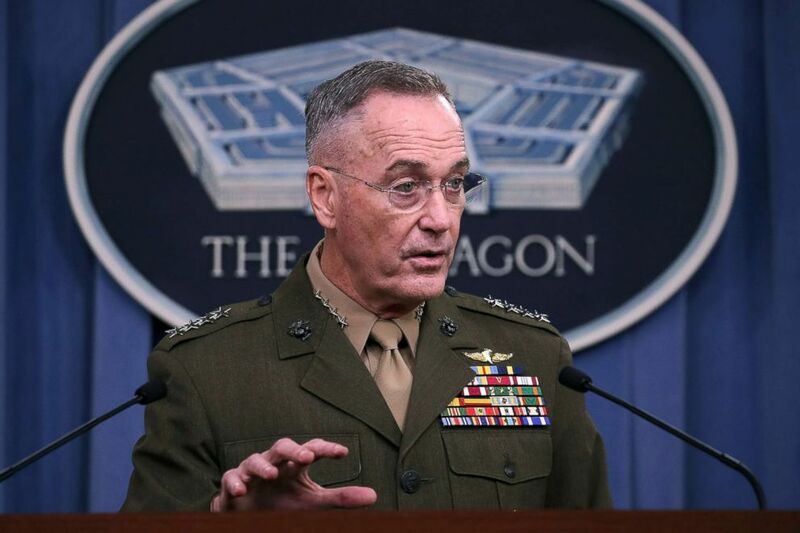 (Mark Wilson/Getty Images) Gen. Joseph Dunford Jr. Chairman of the Joint Chiefs of Staff, briefs the media on the recent military operations in Niger, at the Pentagon on October 23, 2017. Four U.S. Army Special Forces members were killed on Oct. 4 in Niger by militants. At 1:11 p.m., almost three hours into the gunfight, the refueled drone arrived on station over Tongo Tongo, but by then the fight was all but over, the AfriCom briefers told the families, contrary to a public statement by Gen. Dunford on Oct. 23, who said a drone was overhead "within minutes" of the team calling for help and was "right over the scene of the troops in contact." Twenty-three minutes after calling "Broken Arrow," French Mirage fighter jets made the first of two flyovers, but did not drop ordnance on the enemy because they could not tell friend from foe, the families were informed, though it is unclear why. A half-hour later they made two more passes over the village but dropped no bombs. The drone video showed the attackers walking away from Tongo Tongo in no particular hurry. "Why the f--- didn't we follow them with the drone and go kill them?" one relative said after watching it. Cheffou's men are believed to be responsible for the Tongo Tongo ambush, but he has not been apprehended or killed. Family members who spoke to ABC News said they do not feel they have all the answers but now understand that command and control of the team had been compromised repeatedly. "The unit got separated and that's how all four of them ended up dying," one said. "We just want to know exactly what happened to them,” said another parent. “There was a lot of confusion." ABC News’ Luis Martinez, Ian Pannell, Michael DelMoro and Elizabeth McLaughlin contributed to this report.